Well it’s that time of year again, only a few hours left to panic buy food for the famine which will ensue as the shops will be close for a full 24 hours. There’s still time for the last minute panic buying of Christmas presents , or to start you shopping like me. It’s been a busy and interesting year and we are looking forward to 2016 when we’ll see you all out on the hills. We have been doing a lot of work behind the scenes to improve the website speed and resolve some gallery issues with were preventing the images from displaying properly recently. The server has been upgraded which has given a speed boost to the images and we are still tweaking the settings and the layout. This work is nearly completed so hopefully we can get back to the fun stuff now, taking photos. Lots happening behind the scenes at the moment but not much in the way of photos been taken. That all changes this weekend with the Annacurra IMRA winter league hill race. 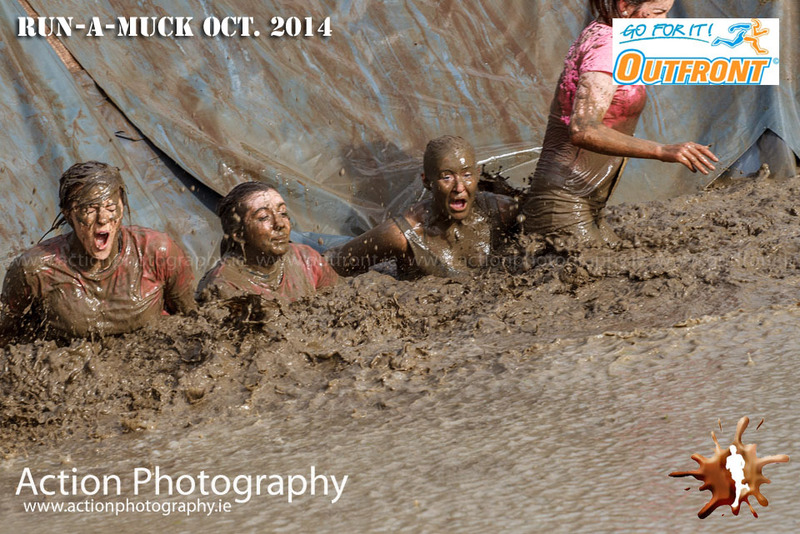 Followed by the ever popular “Run-a-Muck” organised by Outfront down in Johnstown bridge. If you haven’t registered, and 6,000 have, you will have to wait till October before you can do this event in 2015. A long cold night followed by a cold bright dawn and freezing fog at the top of the mountain, so how was your Friday night? 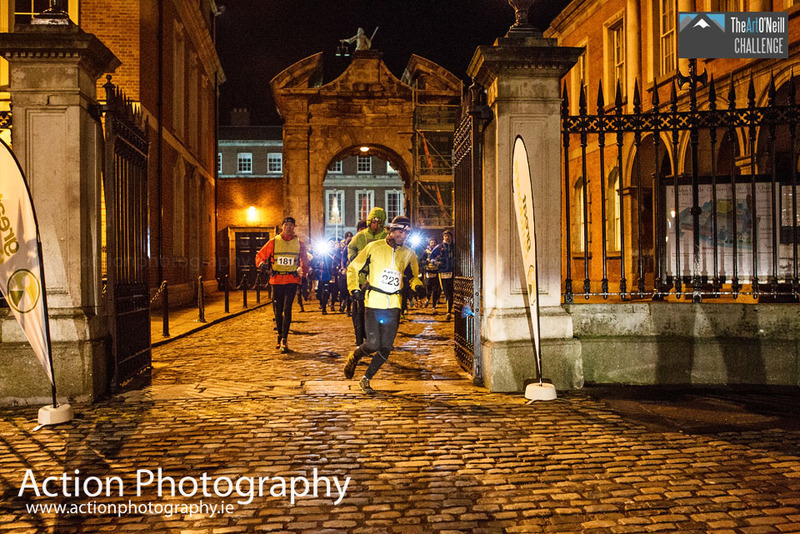 Once again the 200 hard souls headed off from Dublin Castle in the centre of Dublin towards Glenmalure 53km away at the other end of the Wicklow mountains. The event recreates the famous escape of Red Hugh O’Donnell, Art O’Neil and his brother Henry from the castle in 1592 (believed to be the only successfully escape attempt from the castle in its history). Action Photography’s John Shiels was there to see them all off and then follow them on their trail southwards through the night. The first group left the Castle at midnight and planned to walk the entire way. they were followed an hour later by the runners who were planing on running the first 30km road section to Checkpoint one and then walking the remaining cross county sections to the finish via CP 2 and Art’s Cross. 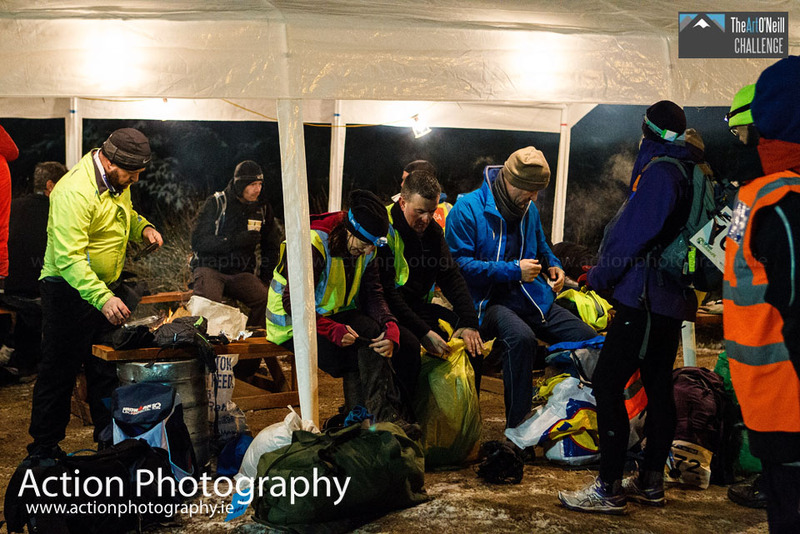 At 2 am the Ultra runners left hot on their heals with the intention of running the entire route, course record is around 5.5 hours. The temperature was above freezing in the city centrer but soon dropped below zero up in the hills above Dublin. By the time I got to stone cross there was snow on the road and only the fact I have Snow tires on the van I’d have been taking the long way round to Check Point one (CP1). CP1 Was an oasis of light and heat in the forests near black hill with hot soup, tea and coffee courtesy of the “Last lap cafe”. Two large fire pits where very welcome but hard to leave after 4 hours walking but somehow they manages to head off south again. 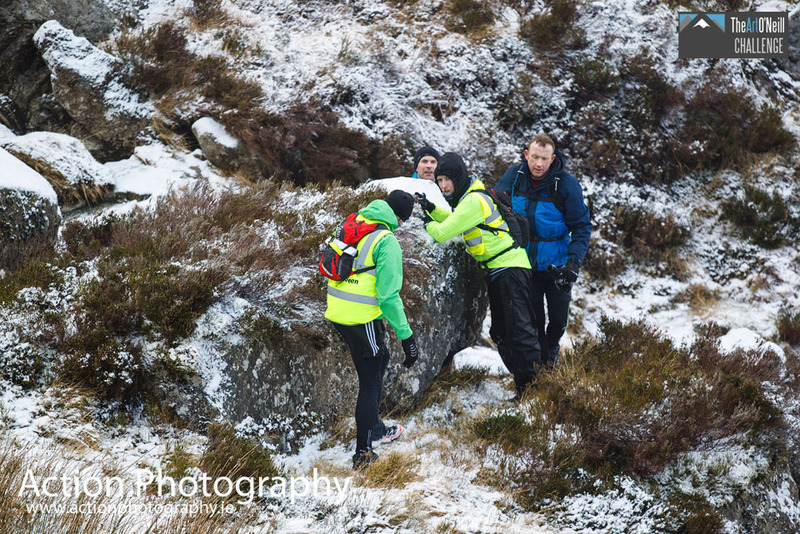 Volunteers from the Dublin & Wicklow Mountain Rescue Team operated the checkpoint and took 60 of the participants across the hills in 3 guided groups. Dawn saw me at CP2 where the scouts of the 65th Dublin (Greenhills) Scout Group had hot porridge and an other log fire to tempt the weary from completing the walk. with the sun up (somewhere behind the clouds) I headed up to Art’s Cross with a group of walkers before letting the keep going while I took photos (which is also a euphemism for getting my breath back). Arriving at the cross at 10.am it was below freezing, covered in snow and not the kinda place to be hanging around but I did anyway. The first guide group came trooping over the hill about 10 minutes later so we took a few selfies and went our separate ways, me back to CP 2 and they continued on to the three lakes and the finish. On the way back to CP 2 I meet a number of peopel who were self guiding and still going strong despite being up for 36 hours at this stage. Remember most, if not all, had put in a full day at work before heading to the castle on Friday night. Back down to the memorial plaque at the foot of the very steep drag up from to the cross I came across the remaining two guided groups who were still smiling despite the cliff rearing up in front of them. Last night saw the formal opening of the special Christmas Art Exhibition in aid of the Dublin & Wicklow Mountain Rescue Team in the Law Library’ s Distillery Building on church street by David Barniville SC, Chairman of the Bar Council. Paintings, photographs and kiln formed glass pieces by local and international artists were on display and many of the artists were on hand to discuss their work. The exhibition was organised by Action Photography’s John Shiels with the aid of and well know mountain runner Ercus Stewart SC. Both Ercus and John as well as AP’s MagsR had a number of pieces on display. Belfast based glass artist Sean Campbell (seancampbell.co.uk)had some of his newer pieces alongside some of Daragh Muldowney’s (dulraphotography.com) “Out of Thin Air” collection. Ukrainian artist Tetyana Tsaryk (www.tsarykozernyy.com) and Lithuanian artist Vladislav Dainovski (www.dainovski.com) presented a larger selection of Oil paintings. The Dublin/Wicklow Mountain Rescue Team carry out a 24/7 rescue service to those who find themselves lost and or injured in the mountains. It costs on average €50,000 to run our team on a yearly basis. We get a government grant of €14,000 and the rest of the money has to be raised by relying on donations and fund-raising events. Ercus Stewart SC and David Barniville SC, Chairman of the Bar Council. 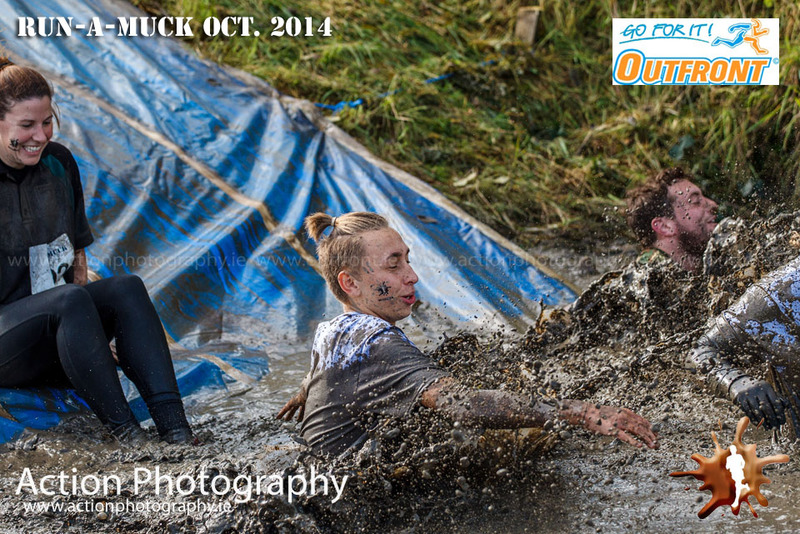 That’s right, the second Run-a-Muck of 2014 is on this Saturday and its shaping up to be another great event, we’ll be there getting destroyed with the best of them, cameras double wrapped in plastic just to be sure. If you haven’t done a Run-a-Muck before you really should give it a go. It’s a fun event with none of the Macho Bull**** that some similar events go in for. With the option of a one or two lap course you are never that far from the start finish area (i.e hot food, cake, fruit and toilets) also making it easy for spectators to see what’s happening and cheer you one. “The Runamuck Challenge is a cross country event over a wet and mucky course with many man made and natural obstacles like bale “jumps”, net scrambles, super slides, tarzan swings, bridges, ditchs, streams, tyres & tunnels. It is designed to test your mental and physical strength and will leave you with a big grin on your face smiley! Despite the forecast earlier in the week the day dawned dry but overcast with a stiff breeze. An early start saw MagsR and myself down in Glasson for 9.30am and time to drive the course to look for likely spots to capture runners later. We settled for the main road in Glasson to start and then drove up to the 5 mile mark via a short cut. From there Mags took the high ground at the top of the hill while I walked about a kilometre down the course and back. We then headed over to the last junction at the bottom of the hill around the 19 mile mark and I took a walk up the lane to the “1 KM to go” sign. The rain held off and a new course record was set by Gary O’Hanlon in a savage time of 1:45:12 followed home by Barry Minnock in 1:49:55 ahead of Liam Feely in 1.49.57 First lady home was Fiona Stack in 2:09:15 ahead of Angela McCann 2:12:53 and Teresa Agar in 2:14:04. On Wednesday evening I had the pleasure of attending the opening of Daragh Muldowney’s latest exhibition, and book launch, for “Out of Thin Air”, in the Copper House Gallery, Synge St. D2. Daragh has put together an amazing collection of images, taken during his trip to Greenland in 2013 on board the Killary Flyer. The exhibition and book were made possible by a “fundit” campaign which I was part of. I would strongly recommend a visit, even if you are not in the area. The book is superb and woud make a great Christmas present. The exhibition will continue until November 7th and Darafh should be there most weekends if you would like to drop in and say “Hi. they are open 9am-5pm daily, 10am-5pm weekends. Yes, its that time of year again…. just over a month to go to the Dublin city Marathon training should be nearly done and it time for a 3/4 to see how well you are prepared for the big one. Don’t be fooled by the notion that Athlone is bang slap in the middle of the country, or “the Midlands” as we call it. “The Midlands” may be flat and at times soggy but this course is anything but. Now in it’s 5th year the course covers roads and country lanes around the village of Glasson, starting and finishing at the Glasson Golf Hotel. Full details on the race website. 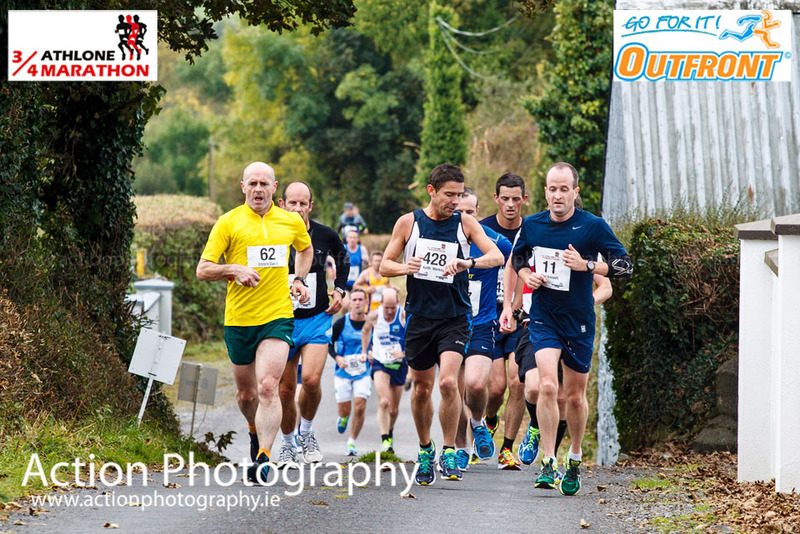 Next Saturday morning (20th Sept.) a couple of hundred hardy souls will line up to take part in this year’s Moxie AR. Both John and Eithne from Action Photography will be there and wearing race numbers for a change, (for John at least). As I, (John), am normally covering events I don’t get as many chances to take part in races as I’d like so I’m really looking forward to lining up beside the people I’m normally shooting and will be wearing my GoPro to capture the race from the inside. Just two more sleeps till one of the best multi-sport races of the year, the Achill ROAR. Organised by Outfront events Achill is in it’s 5th year and never fails to impress, with three course covering the entire Island there is something for everyone, from the total novice to the expert adventure racer. We’ll be there and you still can be too. Tomorrow (21-07-14) will see us out in Howth for the last race of the Howth challenge series with the third aquathon race. Registration closes at midnight tonight, Sunday, so there’s still time to get in there. I’m not a great one for updating the blog so new mid year resolution is to do a bit more on the news front. First up we had the second race of the Howth Challenge series last night and race 3 “the Escape form Ireland swim” will be taking place this Sunday the 29th at 9.00 am.